This is a view of the constellation Orion on January 5, 2019, from Carranza Field in Wharton State Forest, NJ. Taken at 10:57 pm EST with a Canon 6D digital SLR camera on a fixed tripod, and a Sigma 50 mm f/1.4 Art lens with a Hoya "diffuser" filter. It was exposed 4 seconds at f/2.0, ISO 3200, 4400 K white balance. Besides size reduction for this page, no adjustments were made. The field is 39° wide x 27° high. This grab shot is mainly a test of a diffusion filter to enhance the visibility and color of the stars. Mouseover for labels. Below is a picture of the Big Dipper in Ursa Major taken at 11:13 pm EST with the same equipment as above. Exposed 4 seconds at f/2.0, ISO 1600 (one stop less than the Orion shot), 4400 K white balance. Besides rotation and size reduction for this page, no adjustments were made. Light pollution in the northeast creeps in towards the bottom. Below this image is a ≈23% crop (8.9° wide x 6.7° high field) of the area around Mizar and Alcor, the double star at the middle of the handle. Those two stars are easily visible in the original and the crop, but in the crop, the star between them, Sidus Ludoviciana (Ludwig's Star) is also visible. Almost a surprise to see it with just a 50 mm focal length plus a diffusion filter. At center, Alcor (left), Mizar (right), and between them, Sidus Ludoviciana (Ludwig's Star). 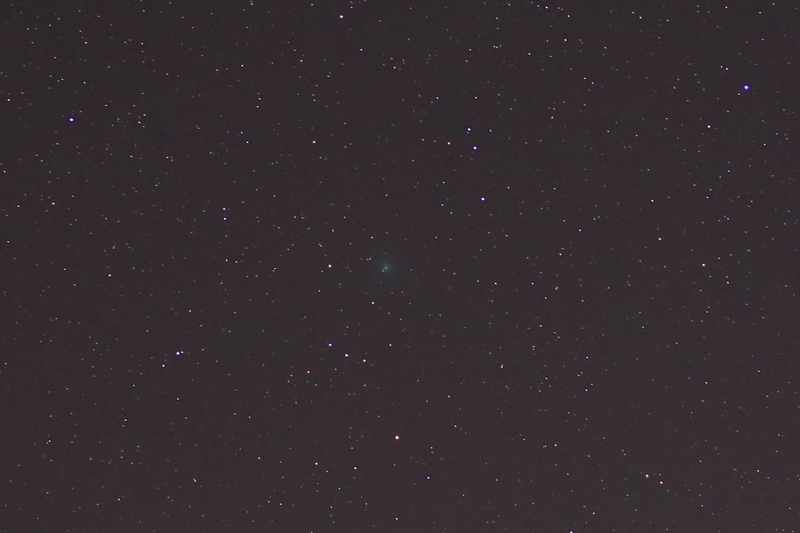 This is a view of comet 46P/Wirtanen in Lynx on January 5, 2019, from Carranza Field in Wharton State Forest, NJ. Taken at 11:01 pm EST with a Canon 6D digital SLR camera on a fixed tripod, and a Sigma 50 mm f/1.4 Art lens with a Hoya "diffuser" filter. It was exposed 6 seconds at f/2.0, ISO 3200, 4400 K white balance. Besides slight cropping (83% of original linear dimensions) and size reduction for this page, no adjustments were made. The field is 33° wide x 22° high. Mouseover for labels. Here's my 46P sighting log for 2018/2019. The image below was taken at 11:04 pm with the same equipment and settings, except there was no diffusion filter. There were no adjustments besides cropping to about 45% of the original linear size for a field 18° wide x 12° high. Mouseover for labels. 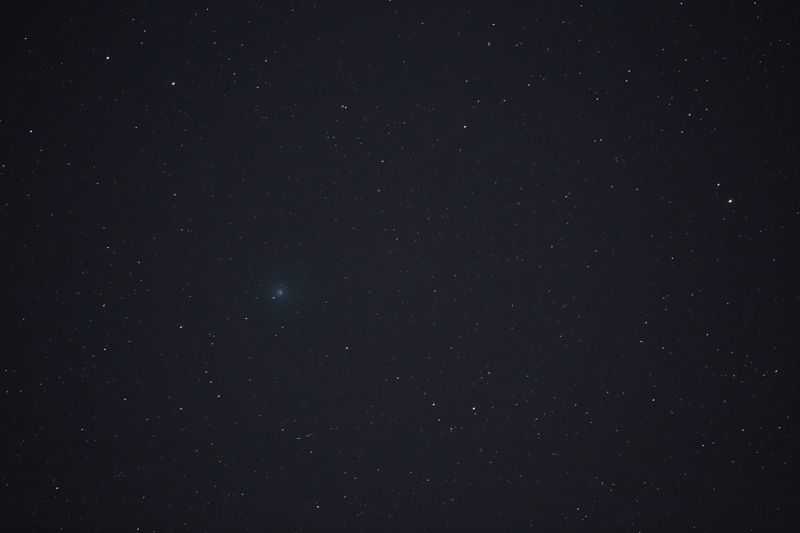 This is a view of comet 46P/Wirtanen in Auriga on December 27, 2018, from Swede Run in Moorestown, NJ. Taken at 4:17 am EST with a Canon 7D Mark II digital SLR camera and a Canon 200 mm f/2.8L lens (on a fixed tripod). It was exposed 2.5 seconds at f/2.8, ISO 1600, 4200 K white balance. Besides cropping the height to a 16:9 ratio, and size reduction, no adjustments were made. The field is 6.4° wide x 3.6° high. Mouseover for labels. At the time, the comet was at 43° altitude and 309° azimuth, while the 72% illuminated moon was at 61° altitude and 176° azimuth. 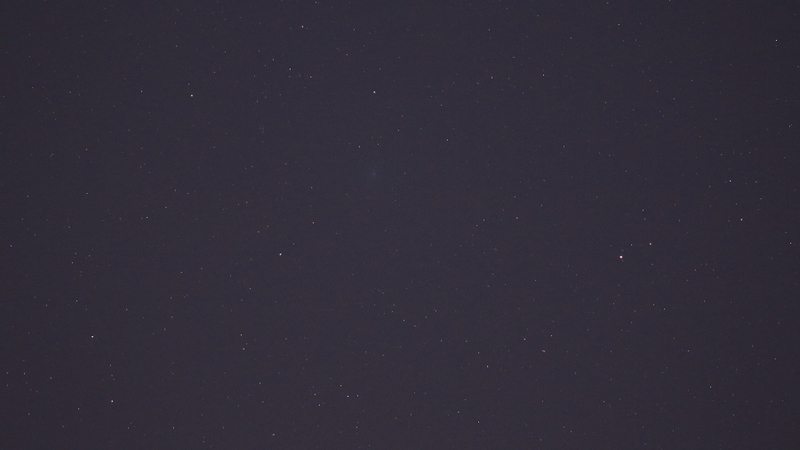 The sky was hazy and 46P was barely visible in 15x56 binoculars. This snapshot of the planets Mercury and Jupiter was captured on December 25, 2018, at 6:15 am EST from Carranza Field in Wharton State Forest, NJ, with a Canon 7D Mark II digital SLR camera (on a fixed tripod) and a Sigma 50 mm f/1.4 Art lens. Exposed 0.8 second at f/2.8, ISO 800, daylight white balance. It was cropped to 66% of the width x 76% of the height yielding a field 17° wide x 13° high. At the time, magnitude -0.4 Mercury was at 3.9° altitude and 4.2° east of magnitude -1.8 Jupiter, which was at 6.9° altitude. Mouseover for labels. Here's my 2018 Mercury sighting page. This snapshot shows the asteroid (1) Ceres (or minor planet or dwarf planet), near the planet Venus on December 25, 2018, at 6:08 am EST. It was captured from Carranza Field in Wharton State Forest, NJ, with a Canon 7D Mark II digital SLR camera (on a fixed tripod) and a Sigma 50 mm f/1.4 Art lens. Exposed 4 seconds at f/2.8, ISO 800, daylight white balance. It was cropped to 38% of the width x 35% of the height yielding a field 9.8° wide x 6.0° high. At the time, magnitude 8.9 Ceres was 3.3° from magnitude -4.5 Venus. The 13.4 magnitude difference is equivalent to about a 229,000x difference in brightness (and hence the vastly overexposed Venus). Mouseover for labels. 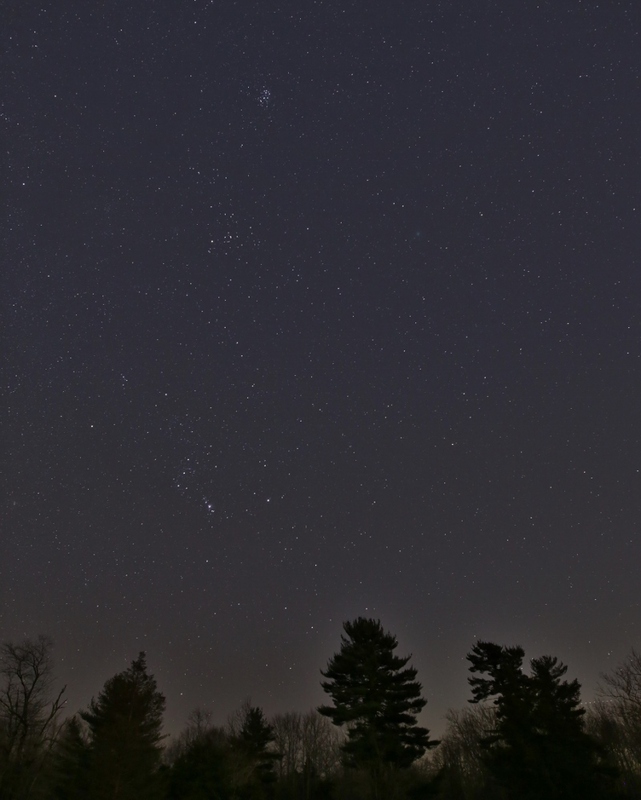 This wide-field snapshot of comet 46P/Wirtanen was captured on December 11, 2018, from Atsion in Wharton State Forest, NJ. It was taken at 8:56 pm EST with a Canon 6D digital SLR camera (on a fixed tripod) and a Sigma 20 mm f/1.4 Art lens. It was exposed 13 seconds at f/2.8, ISO 3200, 3800 K white balance. Brightness and contrast were mildly adjusted, then the vertical composition was cropped to an 8x10 ratio yielding a field 62° wide x 73° high. The comet was 53° altitude at the time. Mouseover for labels. 46P was an easy target with my 15x56 binoculars, and I could glimpse it with unaided eyes, but probably less conspicuous with unaided eyes than it is in this picture. The comet had crossed the border from the constellations Cetus into Taurus about 2 pm on December 11 and will be between the Hyades and the Pleiades on the night of December 15 (but the first-quarter moon doesn't set until half an hour after midnight). It will still be nearly between the Haydes and Pleiades on the night of December 16, but moonset is around 1:30 am. Perihelion is on December 12 and perigee is on December 16. This is a closer view of comet 46P/Wirtanen near the Hyades and Pleiades star clusters from Atsion on December 11, 2018. Taken at 9:13 pm EST with a Canon 6D digital SLR camera (on a fixed tripod) and a Canon 40 mm f/2.8 "pancake" lens. It was exposed 13 seconds at f/4, ISO 6400, 3800 K white balance (so the coma looks a bit bluer than it really is). Besides cropping to about 70% of the original size, then size reduction, no adjustments were made. The field is 35° wide x 24° high. Mouseover for labels. This even closer view of comet 46P/Wirtanen was also captured on December 11, 2018, from Atsion. Taken at 8:18 pm EST with a Canon 6D digital SLR camera and a Canon 200 mm f/2.8L lens (on a fixed tripod). It was exposed 4 seconds at f/2.8, ISO 6400, 3800 K white balance (again, the coma is a bit too blue). Besides size reduction, no adjustments were made. The field is 10.2° wide x 6.8° high. Mouseover for labels. The previous night (December 10, 2018, 11:59 pm), I spotted 46P near Kappa¹ Ceti with 15x56 binoculars from my light-polluted, suburban front yard. While not nearly as obvious as it was with the 15x56s at Atsion on December 11, it wasn't that hard to see. For reference, Kappa² and Kappa¹ Ceti are 32 arc minutes apart, magnitude 5.7 and 5.0 respectively. Xi and Omicron Tauri are 55 arc minutes apart and magnitude 3.8 and 3.6 respectively. On the evening of December 11, 46P was moving at a rate of 3.7°/day against the background stars, or 9.3"/minute (so motion could be detected in a fairly short period of time). 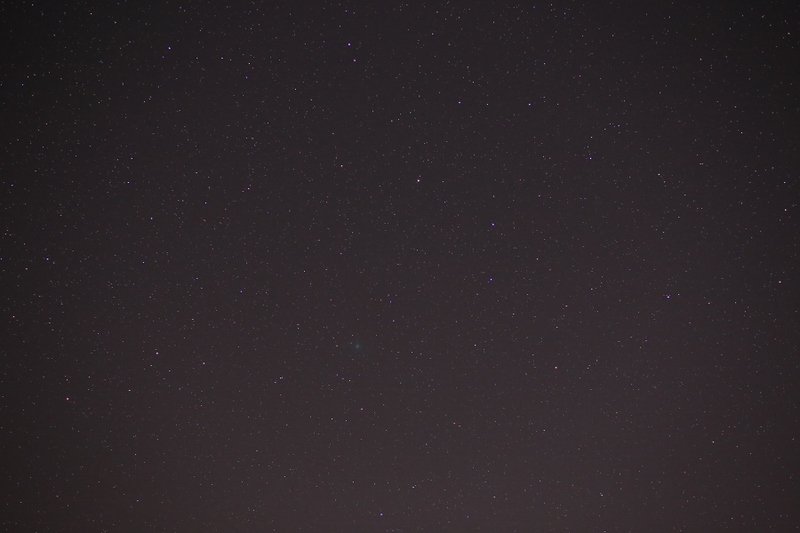 This wider-field snapshot of comet 46P/Wirtanen was captured on December 7, 2018, from Carranza Field in Wharton State Forest, NJ. It was taken at 10:58 pm EST with a Canon 6D digital SLR camera (on a fixed tripod) and a Tamron 45 mm f/1.8 lens. It was exposed 6 seconds at f/2.2, ISO 3200, 4500 K white balance. Except for size reduction, it's straight from the camera (unprocessed and uncropped). The field is 43° wide x 30° high. Mouseover for labels. At the time, the comet was about 42° altitude and 201° azimuth in the constellation Eridanus. Magnitude estimates were running around 5 at the time, but it was just barely visible with unaided eyes, probably due to the large coma which yields low surface brightness. However, it was easily visible in 15x56 binoculars. 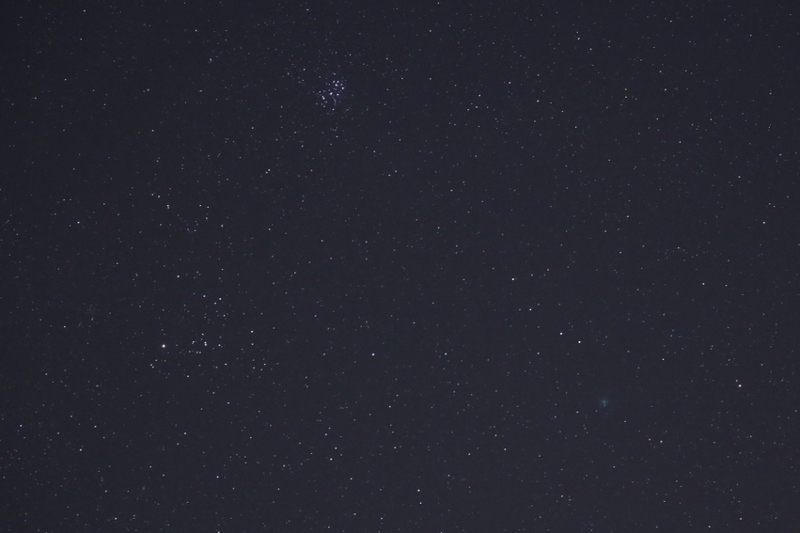 The image below is a 37% crop of the original previous image, yielding a field 17° wide x 11° high; it shows the comet and surrounding stars better. Other than cropping and size reduction, no processing was applied. Mouseover for labels.